Guy Caron, Evelyn Forget, Art Eggleton, Sheila Regehr, Ian Schlakman and Laura Babcock. Living Proof, Hamilton Basic Income Speakers: Jodi Dean, David Cherkewski, Lance Dingman, Jayne Cardno, Rhonda Castello. 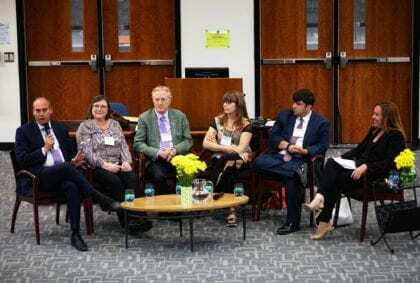 The conference also had the participation of the group Living Proof, a select group of speakers that are participants in the Hamilton Basic Income Pilot. The Basic Income recipients stood up, one by one, and told their stories. Each of the participants spoke of how they went from having a comfortable middle-class life to living in poverty and about the challenges they faced on a daily basis. Jodi, one of the Basic Income recipients, said that she had a normal middle-class life before a divorce left her and her children in a dire situation, especially since one of her children has Brittle Bone disease. She talked about a night when she had a child with a broken leg and had to worry about taking her to the hospital because she had no money to pay for parking. Others spoke about mental health and disability challenges and referred to several difficulties with the current social security system whose job is more felt as policing rather than helping them find exit strategies for their situation. Interestingly, all recipients said they started volunteering in their communities since they have been receiving the Basic Income and this has inspired them to try to change their situation of poverty and of those around them. 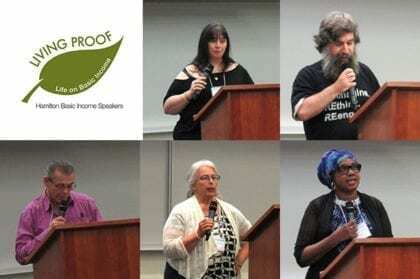 Living Proof, Hamilton Basic Income Speakers: Margie Gould, Jayne Cardno, Lance Dingman, Tim Button, Dave Cherkewski, Jodi Dean, Rhonda Castello and John Mills (Living Proof group coordinator). The event was entitled, Basic Income: Bold Ideas, Practical Solutions, and the main plenary talks were on two themes, Convergence and Reality. The Convergence topic intended to presenting Basic Income from different perspectives, from social justice to health, human rights, faith, technology etc. The Reality theme, which goes beyond the reason why we need a Basic Income, included implementation issues on how a Basic Income should operate, e.g. how to fund it and how to gain public support. 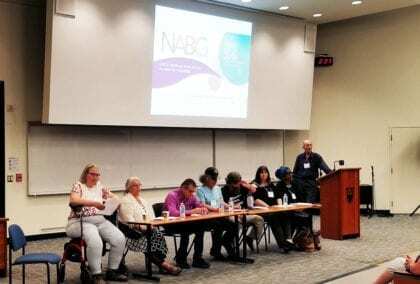 The complete program can be downloaded here and the paper and presentations will be available at the Basic Income Canada Network website after June 17th. So far I have attempted to leave 2 comments (one as a ‘contact us’) only to be stopped by so-called loading problems pop-ups ……Why? WHAT IS (UBI) UNIVERSAL BASIC INCOME? 1 -It’s a sum of money paid at regular intervals. 2 -It’s paid in cash money rather than, say, food stamps etc. 3 -It’s paid to individuals. 4 -It’s paid without any means testing. 5 -It’s paid regardless of an individual’s employment circumstances. The exact amount that you’d receive would vary from country to country, but the figure economists keep coming back to for the U.S. is around $25,000 per year. That’s not going to make you rich, but it also means you would meet your basic needs without having to be reliant on work. You wouldn’t necessarily have to give up work but jobs are disappearing. We could all work less and if your job disappears your basic needs will be covered. A Universal Basic Income is within our basic human rights. It is not only about the dollar amount, with UBI everyone is able to create and invent in all facets. Universal Basic Income is a stepping stone to fixing many local and world issues. By no longer needing to chase the dollar to survive we will come out of survival mode and truly flourish, work together and go beyond.